It has been a very long time since the last time I read a comic book. Not that I do not like them. I just got older and started to enjoy books even more. As as Swede and being in my late thirties there was one comic that everybody read when I grow up and that was THE PHANTOM. I had roughly 700 The phantom comics, 300 James Bond Comics and 200 The Saint comics when my collection was at its peak. A few years back a friend of mine (he is now 78 years old) gave me the 23 first issues of SUPERMAN (in Swedish) as a gift. They are amazing to own. What I am trying to say is that I really loved comics growing up. That is why I was so exited to hear that there was a new James Bond comic series coming out. I had never heard of either Warren Ellis or Jason Masters but I did understand that they could pull this of in a great way. I started collecting all the comics but decided to wait and read them until I had them all at home. Of course then it was decided that the VARGR series were to be released in a hardback so I ordered that as well. So now I have finally read the entire series and there is many things I like about it and some I am not too fond of. I will not write a review of the actual story but all I will say is that I like it. The beginning of the comics is more like the film version of James Bond and its trademarked pre credit sequence. I like that a lot, especially since it takes place in Helsinki that is close to Sweden where I live. You have to understand that we, the Scandic people, is not used to having Bond visiting us in any way or form. It is also nice to notice that Bond in the end goes to Norway. Another Scandic country. A country where Bond committed his first kill according to Ian Fleming. I also enjoy that the story is set in present day. There are many scenes within the story were I react to the strips showing Bond with something modern, like a mobile phone that does not work for instance. What I also liked about this story is that there is no Bond girl. We always have that and it feels good that for once she is not present. Some of the pages by Jason Masters are fantastic. 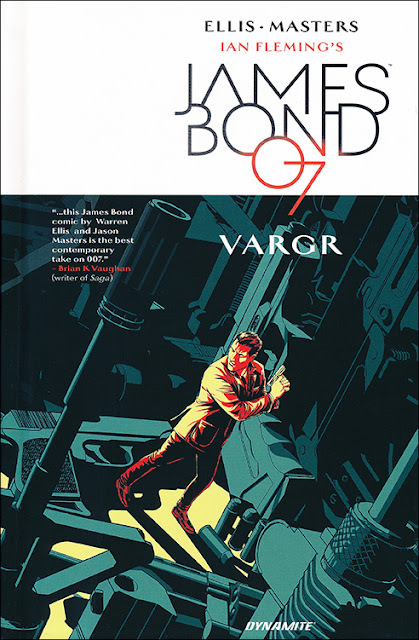 Especially the spread in the end of the series where Bond is sneaking around in a big ship hunting down the villain. I also enjoy a page where Bond is exhausted and needs to stand still and rest with his hands on his knees. We have never seen that in 50 years and that makes him more human in this story. But there is one thing that I think was overdone and not needed. It was the amount of head shots with exploding heads or dead bodies whit blood all over the place. Maybe I am just weak but this has also never been visible before in a Bond film and I like it that way. But I think that this might be just what is Warren Ellis and Jason Masters speciality. Dark and gore. I also get the feeling that at least Jason Masters must have been a fan of Tintin or maybe it is Guy Major who has done the colouration of the book that likes Tintin. For some reason I think of Tintin when I read the strips. I am happy that I bought this book and I will buy the upcoming book as well but I guess it will be out for Christmas or right after. I have already noticed that Felix Lighter will feature in that story. As a special treatment to the fans the book includes all the different cover artworks that was produced for the comic series. What did you think about the VARGR comic? I would love to read your comments below! Warren Ellis and Jason Masters VARGR hardback can be bought here. You can see my other blog posts regarding VARGR here. The hardback cover is shown below.